Recently Essie came out with a new collection (what's new) I swear every second I turn the corner theirs another collection, I can't even use up the ones I got from the last collection before their is a new one. I seen this color and immediately I fell in love. Its such a beautiful color I just couldn't resist on waiting for spring to paint them. I know its still winter but hey I needed a little color in my life. The shade is the perfect creamy bright purple color. Seriously reminds me of Easter. I love it. The formula is so easy to apply, and the consistency is very nice. Surprisingly it is opaque after just one coat however, I really wanted to see how bright it could get so I did apply two here. 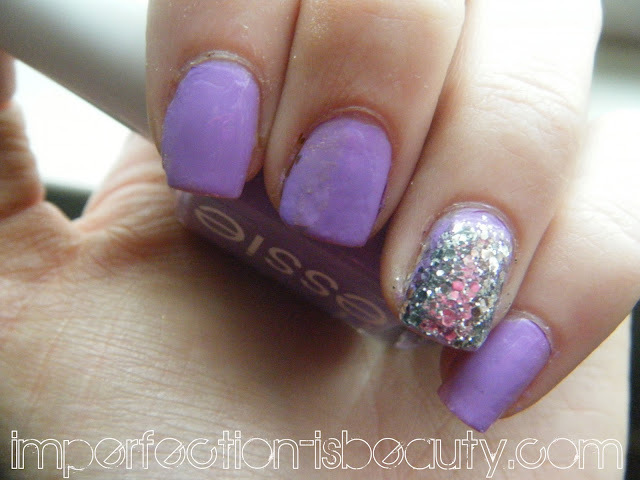 I did use Essies luxe effects top coat to the ring finger layering on the glitter to jazz it up a little. Overall I'm completely obsessed with this color, and I can quickly see it becoming on of my favorites for the spring/summer season. Is it a color you'd pick up? Such a pretty color =) xox love the jewel effects on your nails too! @pink glam I found this at target it was the last one so check their! I also seen it at walgreens today. Pretty chrystals. The purple color is very cute. I would definitely choose this colour. It matches your skin-tone perfectly!